Ancient people saw a lot of strange creatures in the night sky above. They did not have our modern day wonders like iPads or smart phones to distract them. They simply gazed up into the cosmos at night and their imaginations went wild. It is a natural tendency for us humans to see patterns where there are none. Scientists call this phenomenon pareidolia. Who has not looked up at big fluffy clouds lazily drifting across a blue sky and seen faces or animals up there? Constellations of stars in the night sky are another example of visualizing structure where there is none. One of the most terrifying creatures the Greeks saw in the sky was a large dragon named Draco, which is a derivative of a Latin word meaning flying serpent. He is not easy to find up there, but if you want to try to see him start with the bright star Vega, which is just a little west of overhead this time of year. Just north of Vega, two stars close together and of equal brightness are the dragon’s eyes. From there his body trends to the northeast, then northwest, and then north following a line of dim stars that wind their way between the Big and Little Dippers. Right near the Little Dipper a faint inconspicuous star called Thuban used to be the North Star when the Egyptians were building the pyramids thousands of years ago. They even lined up those colossal structures with that dim star. Now due to a slow wobble of the earth called precession, we have another North Star called Polaris. Several stories are associated with Draco from ancient times but the most prominent of these goes back to a fabulous garden belonging to an immortal goddess. A group of nymphs called the Hesperides tended the garden and they were the half sisters of the Pleiades, that beautiful little star cluster we see in the winter sky. The centerpiece of the garden was an apple tree which grew fruit of pure gold. It is said that if you ate one of those apples, which sounds like it would be hard on your teeth, you would become immortal. To keep the nymphs and any passers-by from nibbling on the tempting fruit, a fierce dragon with 100 heads called Ladon guarded the tree. One of these apples played an integral part in the beginnings of the Trojan War. Ladon met his end when the great hero Hercules killed him and stole all the apples. He was placed in the sky by the gods to honor his service in the garden. Hercules too was placed in the sky right near the dragon he killed. The beautiful parade of planets that has graced our evening skies for months are packing their bags and heading out of town. You may have noticed that Venus, the real bright one in the southwest, is getting lower. We only have a few more weeks to see her since she is positioning herself right between us and the sun. 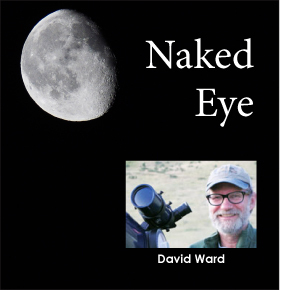 If you have a small telescope or a powerful pair of binoculars, take a look. The planet looks like a little crescent moon now. If you miss Venus in October you can catch her this winter when she makes an appearance in the east just before dawn. The next planet above and to the left of Venus is Jupiter, and it too will drop into the sun’s glare fairly soon. That small telescope will show you four of its 67 moons, which change position around the giant planet from night to night. Saturn is farther still to the left and will be around another month or so. Its rings are spectacular now and you might even be able to spot Titan, its largest moon. Mars, which is left of Saturn, is getting dimmer and smaller. We were very close to the red planet at the end of July, but now we are speeding away from it in our orbit around the sun. Now that the smoke is leaving, go outside and take a deep breath of fresh air and check out what is up in the night sky.